After a college setback and an uncertain start to his pro career, Matt Wivinis is finding his groove with the New York Yankees. The right-hander has climbed four Minor League levels in just two years and is currently enjoying success in the talent-rich Arizona Fall League. But getting here was no smooth road for the 25-year-old, who contemplated walking away from the game in 2016. "I just feel so blessed to be here right now," Wivinis said. "But I'm having fun with the ride, taking it one day at a time and just keeping my mind as clear as possible." Out of high school, Wivinis received a scholarship to pitch for Kansas State University. In his sophomore season with the Wildcats, Wivinis struck out 46 over 68 1/3 innings, and in two outings in the NCAA Super Regional that year he did not allow a run. However, he suffered an arm injury at the start of his junior year that required Tommy John surgery -- and as a result he lost his scholarship. The Downers Grove, Illinois native decided to transfer to Eastern Illinois for his senior season. He pitched poorly that year, however, and finished with a cumulative 5.56 college ERA. After graduating, Wivinis was not selected in the 2016 First-Year Player Draft. "After not getting drafted, I knew I had two options: I could hang up my cleats or keep training and go to tryouts and try to find a team," he said. "But I knew I had a lot more left in me, and not getting drafted gave me motivation to prove that. Then luckily I got an opportunity with Evansville, and then after that I was fortunate to get a call from the Yankees." Wivinis attended a tryout with the Evansville Otters of the independent Frontier League and two weeks later was signed by the club. In 12 regular season games -- five starts -- with the Otters, Wivinis posted a 4-0 record with a 1.58 ERA and fanned 43 while walking 19 over 39 2/3 frames. He made three appearances in the playoffs and recorded two victories. The team went on to claim the Frontier League title, and less than a week later Wivinis received that call from the Yankees. "I went out and bought a Yankee hat that day, and I bought my girlfriend one, too," he said. "It was just a dream come true." Wivinis reported to Rookie-level Pulaski to begin the 2017 season and wasted no time making an impression. Through his first five professional appearances as a reliever, he allowed no runs on five hits and a walk while whiffing 14 batters. In that span he also entered two save situations and nailed them both down. After posting a 0.87 ERA in 12 games -- yielding two earned runs on 14 hits and four walks with 32 punchouts over 20 2/3 innings -- Wivinis was promoted to Class A Charleston to finish the year. He continued his dominance out of the bullpen with the RiverDogs, appearing in seven games and allowing one earned run on three hits without issuing a walk and striking out 14 over 10 frames. "I like coming in late and shutting it down," Wivinis said of transitioning to a full-time relief role. "Just blowing it all out for an inning or two." Wivinis opened this season back in the South Atlantic League and picked up where he left off. In nine appearances with Charleston, he did not allow an earned run or a walk and fanned 14. That performance earned him a promotion to Class A Advanced Tampa on May 9. It was more of the same with the Tarpons for Wivinis, who amassed a 1.76 ERA in 24 games. He yielded six earned runs on 21 hits and nine walks while whiffing 44 over 30 2/3 innings. Florida State League opponents batted .184 against him. "He's a very fun guy to work with," said Tarpons pitching coach Jose Rosado. "He's a very smart kid, and he loves to compete. Every time he goes out there, he is ready. He does his homework before the game and during the game, so by the time he comes in, he's well prepared. Man, he's just fun to watch. "He knows who he is. He knows what he's capable of doing, and he doesn't come out of that. He doesn't try to be something or someone else. He never tries to overthrow -- he's always within himself. And he's level. He shows up to the ballpark every day, and regardless of what happened the day before, he turns the page on it. He just stays on his game. And the moment is never too much. He's able to slow the game down." "I never feel nervous," Wivinis said. "I'm always excited to be in tough situations. I feel like I can just go out there and pitch and not worry about anything else -- like the crowd or the noise. I just block everything out and just throw." 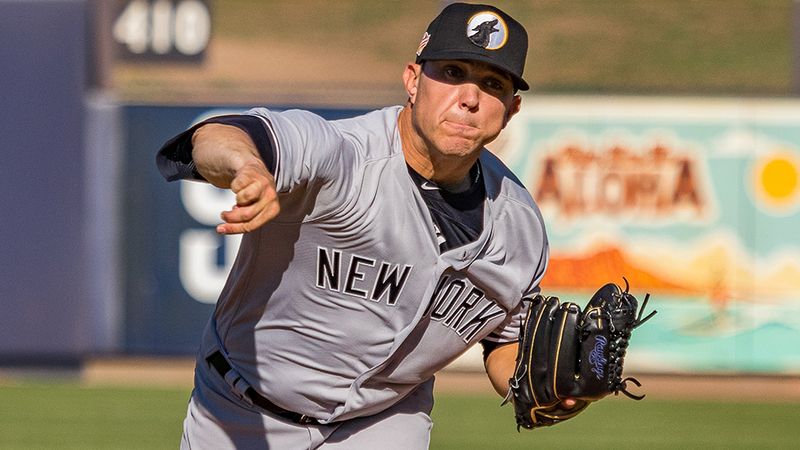 On July 26, Wivinis was called up to Double-A Trenton. In 12 games with the Thunder he surrendered nine earned runs on 13 hits with six walks and 19 punchouts over 16 2/3 frames. "All Matt has done since we signed him is put up really big numbers," said Yankees pitching coordinator Danny Borrell. "He's gotten better each year, and every time we put him at a higher level he meets the challenge. He's done a heck of a job with us. "Everything he throws is above average. The spin rate he gets on all his pitches is off the charts -- in particular his breaking stuff. That's why he gets a ton of swings and misses. And he's got two different fastballs that have a lot of life. He's got a four-seamer that's got a sharp cut to his glove side and a two-seamer that's got great spin and runs away a lot. It's a good mix of pitches, and it's helped him miss bats at every level." In three appearances with the Glendale Desert Dogs this fall, Wivinis has allowed one run on three hits with five walks and three strikeouts over 3 1/3 innings. And the moment is not lost on him. "Being here has been great," he said. "The coaches and the players are all really helpful, I'm getting to know so many people, and the quality of baseball is incredible. Just being around and going up against the top guys in each organization … it's crazy." But Wivinis isn't done yet. "The biggest challenge really is staying focused," he said. "Every time you move up a level, you need to do well, but you also have to understand it's not the level you want to stay at, so you can't get comfortable. So you have to focus on performing well there, but also focus on what you need to do to make it to the next level. You can't settle. I won't settle. I'm always trying to learn and be better." And Borrell is confident Wivinis can get there. "Matt is the kind of guy that regardless of level or where he is, he trusts his stuff and that's a huge component of success for any pitcher. He pitches with confidence and backs it up with a bunch of good numbers throughout the process. We're looking at next year and if he continues to show this kind of success at the upper levels, he may be a Major League option for us down the road." Rob Terranova is a contributor to MiLB.com. Follow him on Twitter @RobTnova24. This story was not subject to the approval of the National Association of Professional Baseball Leagues or its clubs.